Are you looking for the best motorcycle gps unit?The most frustrating thing about riding a motorbike is trying to explore new routes, whilst at the same time having no idea of where you’re going, nor how to get back to your home or worse still, finding out how to get back to that amazing road again. Imagine the situation, you find a perfect road that is empty, a road that is perfect for exploring the limits of your bike, however after you have driven down it, how do you find your way back to that road the next time that you want to head out and really test the limits of your new motorcycle. The problem is that motorbikes do not come with in-built GPS navigation systems and therefore if you want to find out where to go to get to a specific destination or to get yourself home after you have been for a ride, then you’re going to need to buy a motorcycle GPS unit. For a motorcycle you don’t want to be using your smartphone for two key reasons, firstly its not waterproof meaning that if it starts raining or worse still, you drive through a puddle, then it’s going to get wet and you’re going to have a large bill to replace it. The second key reason that you don’t want to use your smartphone comes down to the thought of dropping it at speed. Yes there are mounts, however they’re not always perfect and if you drop your GPS and it breaks into a million pieces, you have a bill of a few hundred dollars, if you drop your smartphone then potential your bill could be much larger. When you’re thinking about buying a motorcycle GPS unit then you need to think about what features you want and which you don’t want. It’s important to remember that you need to make sure that you buy a GPS unit that has been designed for a motorcycle and therefore will comes with the right features included in it. There really is no point in simply buying a car gps unit and trying to make it fit for your bike as it probably will not. As example, storing your gps in a car is very easy, simply put in on the dashboard with a dashboard mat, however with a bike you need to think about the mount and where you’re going to store it to ensure is both safe and you can see it. Screen Clarity - Seeing your GPS in the dark is very easy, but how about in direct sunlight or when it raining and the light is low. Waterproofing – If it rains whilst you're driving it will get wet. How much does it cost – Price is important. A couple of years ago we reviewed TomTom’s and Garmin’s attempts at building a gps unit that was specifically designed for your motorcycle and therefore allowed you to take your motorcycle out in the countryside across the US whilst knowing that you can find your way home. We loved both Garmin’s and TomTom’s first attempts and thus reviewed both models finding out that the Garmin range of gps units were probably better gps devices, but the price tag simply meant they were out of people’s range and thus the TomTom Rider was crown our 2014/15 favourite. 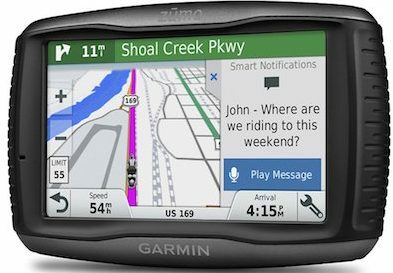 In the last year, both TomTom and Garmin have brought out new models to replace there outgoing range of motorcycle gps units. We have reviewed both models but really have the same result. The all-new Garmin 595LM is a fantastic motorcycle gps unit and comes with a range of features, but the problem is that it also comes with a monster price tag that again is simply not justifiable for your average user. This leaves the all-new TomTom Rider 400 that luckily is a fantastic model and offers superb performance to be our favourite motorcycle gps unit in 2017. The TomTom Rider 400 Motorcycle Sat Nav is TomTom's newly designed and manuaftured motorcycle gps unit that has taken the features that we loved from the outgoing TomTom Rider and added a selection of features that really add to the performance of this all new model. 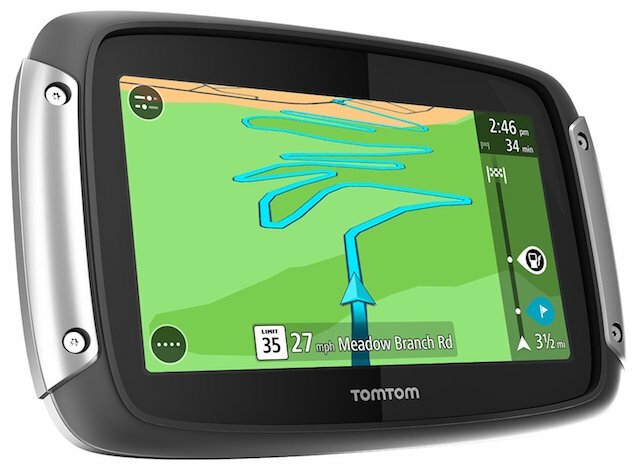 The Rider users TomTom’s all new 3.5 Inch screen that comes with superb clarity meaning that you can easily see your maps and directions in both direct sunlight and in low light conditions. The small screen does mean that you will need to take your gloves off before entering your destination, however using the full QWERTY keyboard is very easy allowing you to quickly enter your address. The maps are fantastic and the turn-by-turn directions are easy to follow either through on screen directions or by using the Bluetooth facility to connect your head-set to the gps unit and hear your directions. The Bluetooth facility also means that you can now take smartphone calls directly using your gps unit and control whether you accept or reject the call directly on your gps screen.Extra features we liked include, speed camera alerts, a massive points of interest database and TomTom My Drive that whilst at present has a few bugs, they are working on it with weekly updates. We love this program as it allows you to create a route using your computer at home, download it onto your gps unit and select it from your stored route when you’re ready. Overall the best motorcycle gps unit on the market in the 2016.
but at the same time the light friendly screen means that you will have no problems seeing your screen in either direct sunlight or in low light conditions. Switching your gps on brings up Garmin’s easy to use interface and menu system meaning you can easily find your way around your gps unit. Once your ready to go, enter your destination and your gps device will calculate your route. Turn-by-turn directions are easy to follow either through the on screen direction or by using the built in Bluetooth unit that not only allows you to hear your directions, but also take hands-free phone calls or listen to music directly on your gps unit, both using on screen controls. As with all of the latest Garmin GPS unit,s the 595LM comes with Free Lifetime Map updates of the USA meaning that you should be able to keep your maps up-to-date. Extra features include an SDcard that allows you to save and store music on your gps unit and listen to it whilst your driving. Overall we love the 595LM, we love the Garmin interface, the extra SDcard to listen to music on and we love the larger screen that really helps to see direction even when active lane guidance switches into view to help with difficult junctions, however what we really don’t like it the price tag. In our opinion the best motorcycle gps navigation system for our 2015 range of motorcycle gps units is the TomTom Rider Motorcycle Navigation Unit given it's both fantastic value for money, easy-to-use, provides all the latest map updates and features to make your Motorcycle Touring as easy as possible whilst keeping you heading in the right direction. Actually, this is a lie, our favourite is the Garmin Zumo 590LM which comes with a 5-Inch screen and a range of features that have been designed specifically to make it the best motorcycle gps on the market, however the problem, and it's a big problem - The price tag is huge a means that for your average rider, it's very difficult to justify buying the Garmin motorcycle gps unit and thus our favourite is the TomTom. 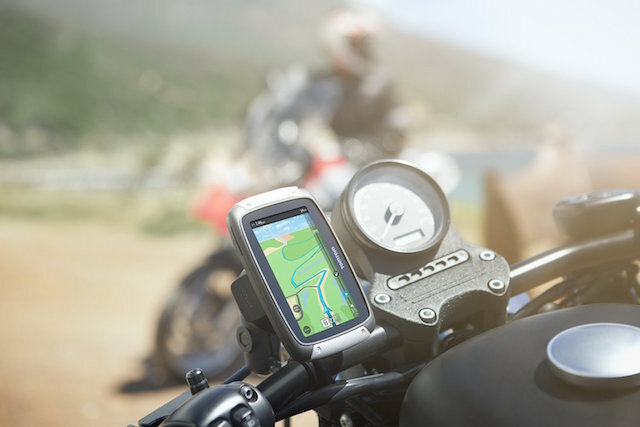 The TomTom rider motorcycle GPS navigation unit is out favourite motorcycle gps unit given that is comes with an all new 4.3-inch screen with superb screen clarity that mean you will be able to see your gps unit even in direct sunlight. The touchscreen can also be used to enter your destination using the predictive text meaning that you can easily calculate your route to your destination. The interface provides you with an easy to use menu whilst the updated maps provide you with turn-by-turn directions that are shown both on screen or can be used in conjunction with a bluetooth earpiece meaning that you will be able to hear the voice directions. The TomTom is completely waterproof meaning that you can use your gps unit even when it’s raining hard, whilst bluetooth has been added to the device which means that if you want to connect your smartphone to your gps unit, you can and therefore can take advantage of the earpiece in your helmet to make a receive phone calls. Battery life is actually very good considering that the gps comes with both a large high definition screen and high-resolution images. For continuous use the gps will easily last for 4 hours which makes it particularly good for longer travel. 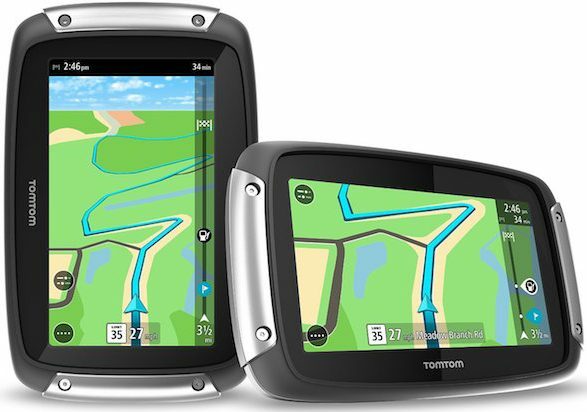 One annoying problem with the TomTom is that it does not allow multiple gps units on one TomTom account which means that if you have both the motorcycle and the car gps unit, you will need two TomTom accounts to update your units. 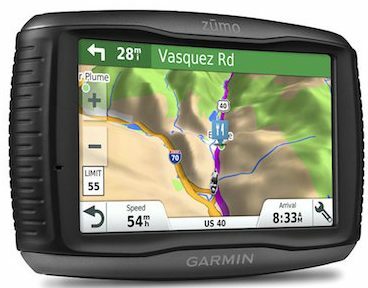 The Garmin Zumo Motorcycle Navigator is a range six navigation units each with their own benefits, however the real problem with the Garmin Zumo range is it’s price. 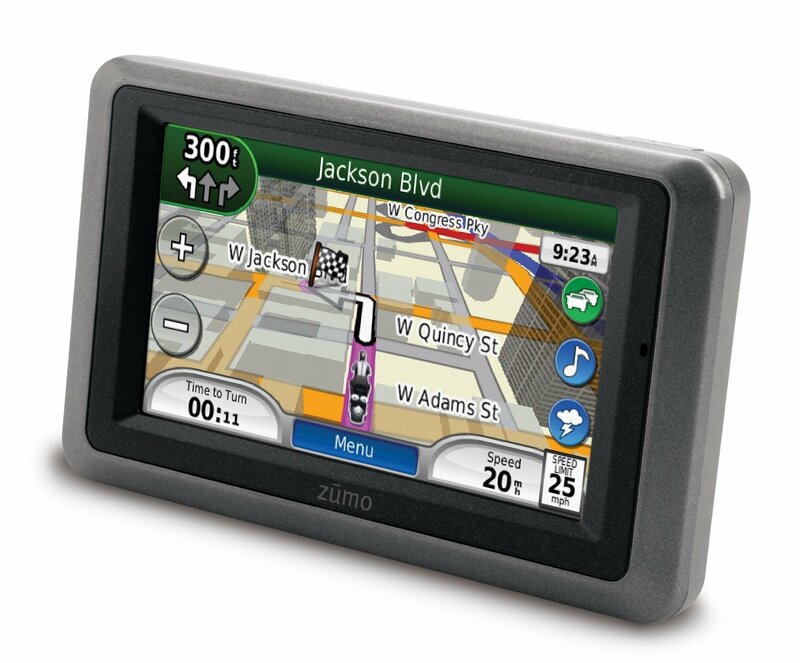 To get a top of the range gps unit that is equal to the TomTom above you need to opt for the Zumo 590LM, which whilst is probably a better gps unit and comes with more features than the TomTom above, it’s the price that put us off. To buy the 590LM, you have to spend over $400 which for a weekend gps unit is really not justifiable for the majority of us. 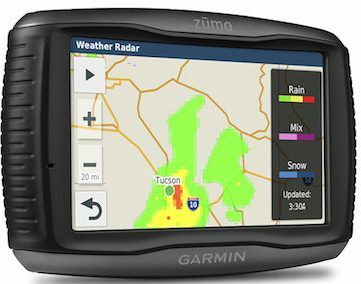 In light of this, our favorite of the range is the Garmin Zumo 660LM which comes with a price tag that is justifiable and enough features that makes it a seriously good motorcycle gps unit. The navigator comes with a 4.3-Inch touchscreen that has a high-resolution screen that ensures that you can use your gps unit in both direct sunlight and in darkness. The unit is small enough that it so that you can mount it either to the handlebars or the center of your bike and the unit comes with a rugged water resistant case which means that you use your gps unit in the wet or the sun. Navigation is brilliant and the gps comes with fantastic turn-by-turn directions on the screen and using the bluetooth the possibility of voice navigation by connecting a earpiece speaker. Other features the Garmin Zumo 660LM comes with include bluetooth wireless technology to connect your cell phone to the headset in your helmet and make phone calls on the go as well as hearing street names and navigation commands to let you keep you eyes on the road, a in built MP3 Player allowing you to listen to music whilst you drive, an in-built trip computer to keep track of your fuel limit and a speed limit indicator to show you when to slow down.